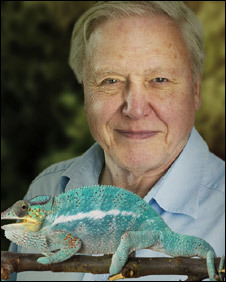 Sir David Attenborough is to front a wildlife programme for Sky's 3D service, the broadcaster has announced. Flying Monsters, which was written by the veteran, will be screened on the channel later this year. The film, which re-enacts the prehistoric period of flying dinosaurs, is also set to be screened in Imax and other 3D cinemas. Sir David said he was "thrilled" to be taking part in one of the first 3D projects for television. He added that he had learnt his TV skills in the era of black and white and had witnessed the advent of colour. "3D is a wonderful way of seeing the world as the pterosaurs did, and it's to Sky's credit that they've taken on the challenge to be the first to broadcast in 3D," said the broadcaster. Sir David is also making a new show centred on the Atlantic for the BBC. Sky's 3D service on satellite had a limited launch earlier this month when a Premiership football match was shown in 1,000 pubs.